It’s a scientific fact: Women rock! A charmingly illustrated and educational book, Women in Science highlights the contributions of fifty notable women to the fields of science, technology, engineering, and mathematics (STEM) from the ancient to the modern world. Full of striking, singular art, this fascinating collection also contains infographics about relevant topics It’s a scientific fact: Women rock! 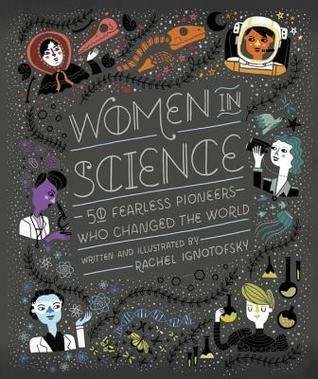 A charmingly illustrated and educational book, Women in Science highlights the contributions of fifty notable women to the fields of science, technology, engineering, and mathematics (STEM) from the ancient to the modern world. Full of striking, singular art, this fascinating collection also contains infographics about relevant topics such as lab equipment, rates of women currently working in STEM fields, and an illustrated scientific glossary. The trailblazing women profiled include well-known figures like primatologist Jane Goodall, as well as lesser-known pioneers such as Katherine Johnson, the African-American physicist and mathematician who calculated the trajectory of the 1969 Apollo 11 mission to the moon. Women in Science celebrates the achievements of the intrepid women who have paved the way for the next generation of female engineers, biologists, mathematicians, doctors, astronauts, physicists, and more!